The Meizu MX4 Pro comes with the custom-made Flyme OS, now in its 4.1 installment. It's based on Android KitKat 4.4.4 and it takes after its Chinese siblings from MiUI and others and has a one-level interface with only homescreen and no app drawer, similarly to Apple's iOS. Here's a quick look at Flyme OS 4.1 on the Meizu MX4 Pro. The lockscreen on the Meizu MX4 Pro is a pretty simple affair. You drag upwards to unlock and have the option of securing it with a passcode or an unlock pattern. There are no shortcuts on the lockscreen and you can get into the homescreen or camera with a simple swipe on the screen even when it's off. A swipe to the right can bring up a predefined app, a swipe down will bring down the notification area and a swipe upward will unlock the phone into the homescreen. Holding down the home button will lock back the device. You can also assign a number of functions to tapping the home button - you can set it go back in the UI, close an app or go back to the homescreen. Meizu's new mTouch technology works very similarly to what Apple has implemented. You don't need to swipe your finger on the sapphire glass pad - a mere touch would do. You can setup five fingerprints in total and the procedure is a simple and short process. The fingerprint sensor can scan your fingerprint at any orientation so no matter how you place your finger the phone, it will still recognize it. Meizu claims the task of finger unlocking takes up to 0.5s and we found it to be instantaneous most of the time. The homescreen is simpler still. You get two panes by default but you can add more later on. The homescreen gathers all of your app icons and you can add widgets into the mix. Aside from adding widgets you can also align the app icons to either the top or the bottom of the screen - a step up from the iOS homescreen, which has a mind of its own in this regard. The notification area pulls down the whole way and not just for a single roll like before. You get a set of five circular toggles for various settings and you can expand them with a swipe down or with the dedicated virtual button in the top right. 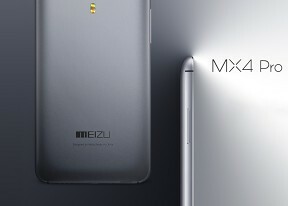 Meizu has added what they call Smart Touch to the MX4 Pro. It's a small dot that you can place anywhere on screen. It can minimize the screen contents to half of the display canvas, just like on iOS. A swipe on the small dot will move you through the opened apps on the MX4 Pro. Switching between tasks is done with a pull up menu from the bottom of the screen. It looks like iOS 6 in a way but works differently - you have to swipe apps up or down to dismiss them. The settings menu on the Meizu MX4 Pro is laid out in a tabbed interface, with the main categories on the left and the related options on the right. In the default view, the settings categories are just icons but a swipe will reveal their full names if you can't find what you're looking for. You can customize the UI with various themes. There are some preloaded but you can browse the App Center for more - some of them are paid but there are many free and a lot to choose from. There's also a variety of built in wallpapers. Lastly, there's a Do Not Disturb mode that will block notifications and calls and you can choose a white list of numbers that can get through. It can be scheduled to run at specific time intervals or be set manually. The resemblance to Apple's iOS is hard to ignore but that's true of most custom launchers that come out of China these days. That doesn't make Flyme OS bad though.